Model Centering in Cura/UM2 Print Bed? Posted January 10, 2015 · Model Centering in Cura/UM2 Print Bed? I am printing a rectangular terrain section which takes up most of the UM2 print bed. 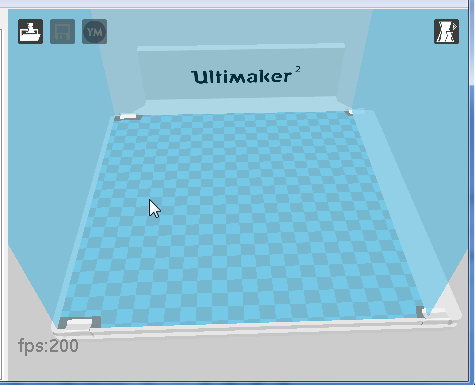 I notice that when I view the model in Cura, the model seems to be perfectly centered in the checkerboard print area. But when the model is actually printed, it's not centered on the glass at all... on the X axis it is way to the left and on the Y axis it is toward the front. Shouldn't it be printing centered on the print bed? Seems like it should be centered in order to have the heated bed work better as well as make leveling more uniform. Is this normal? It's a bit hard to see on the printing shot but you can see where the print bed clips are and the print is shifted to the left side and towards the front of the print bed. this is something that I have never seen before. What I would spontaneously think that maybe the metalends of the endstops are bent and thus the zeropoint is incorrect. Posted January 11, 2015 · Model Centering in Cura/UM2 Print Bed? Cura takes this into account but doesn't visualize it (AFAIK). I assume the offset you noticed is equivalent to the difference of the values in the machine settings of Cura. Take a look into the section "Printer head size". Thanks very much for the ideas! That sounds possible and probably true. Not a huge issue but still it would be nice if Cura could display the model precisely as it will be printed on the print bed. It does seem like a print happening more precisely in the center of the bed would make for better heating and leveling but maybe that's not an issue. This has to due with the fact that the bed is prepared for 2 extruders, but the primary cannot reach the outer right area.